A hospital is made up of several departments, including ICU and CCU facilities. While both departments offer comprehensive care to patients, there are marked differences between the two. They are laid out in this article. An ICU, also known as “intensive care unit” or “intensive therapy unit,” is a special hospital facility designed to provide intensive treatment for patients suffering from life-threatening injuries or diseases. An intensive care unit is equipped with medical apparatus that electronically monitor vital signs such as respiration, heart rate, and blood pressure. Patients from a ward, an emergency department, or a surgery may be admitted to an ICU, depending on the severity of their condition. Monitored by highly trained nurses and doctors, patients in the ICU receive special care. A CCU, on the other hand, is a hospital facility specializing in the care of patients with life-threatening cardiac conditions. Also known as “cardiac care unit” and “critical care unit,” a CCU is equipped with a heart monitoring device. Aside from patients who have undergone a heart surgery, those who are diagnosed with cardiac dysrhythmia and unstable angina can also be admitted to a CCU. A CCU is monitored by nurses and doctors specializing in cardiac care. So what’s the difference between an ICU and a CCU? Although these departments both provide intensive care, they focus on patients with different life-threatening conditions. Firstly, ICU is a shortened term for “intensive care unit.” It is a hospital facility that specializes in providing intensive treatment for patients suffering from life-threatening diseases such as sepsis, multiple organ failure, severe trauma, and adult respiratory distress syndrome (ARDS). CCU, on the other hand, is an abbreviation for “cardiac care unit” or “critical care unit,” depending on the term used by the hospital. A CCU is a special facility designed to closely monitor patients diagnosed with cardiac conditions like heart attack, cardiac dysrhythmia, and unstable angina. Patients who underwent a heart surgery are also admitted to a CCU for post-operative care. Since the focal point of care is different for both departments, an ICU and a CCU are equipped with different sets of medical apparatus. 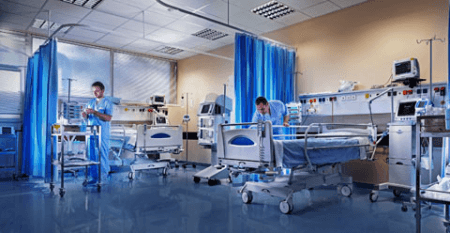 Typically, an ICU contains heart monitors, pulse monitors, mechanical ventilators, respirators, defibrillators, suction pumps, dialysis equipment, catheters, intravenous lines, and other equipment used to monitor fluids. Meanwhile, a CCU contains cardiac machines like heart monitors, electrocardiograms, and EKGs. A CCU also houses machinery found in the ICU such as ventilators, respirators and pulse monitors. In some countries, a CCU falls under the different subsets of an ICU, which also includes NICU (neonatal care unit), PICU (pediatric intensive care unit), PACU (post-anesthesia care unit) and NeuroICU (neurological intensive care unit). Lastly, doctors and patients assigned in an ICU and a CCU have different subspecialties. The staff in an ICU mainly focus on providing care for patients who are diagnosed with conditions that affect the major systems of the body, while CCU staff specialize in cardiac care.